We started our Hawaiian adventure in a rental guest house in Hawi on the northwest side of the island. We settled in and visited the local grocery store for provisions. By early afternoon we were ready to start exploring. Of course the first thing we wanted to do was hit a beach. A friend who lives on the Big Island recommended one on Waialea Bay known as Beach 69 (for the road marker along Highway 19). 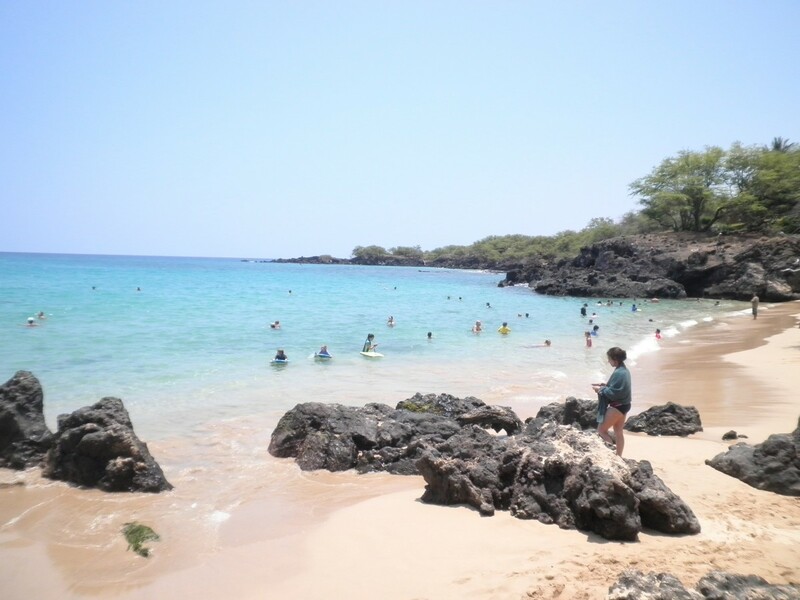 You have to drive past Hapuna Beach to get to 69 but it's worth it because Hapuna gets very crowded. Beach 69's waves were gentle that day, which also made the snorkeling great. We only had two snorkel sets, so we took turns going out among the coral to see a wide variety of fish. The best part is that we didn't have to go very far from shore -- maybe 20-30 yards. There were some jagged rocks at one end of the beach. They reached up about 15 or 20 feet. Local swimmers were having fun jumping into the waves crashing along the bottom of the rocks. It looked a bit dangerous but our 13-year-old watched eagerly. I was pretty sure he'd join them before our trip was done. One thing we all enjoyed was the shade from the trees along the beach, which meant that we didn't have to sit in the sun when we took a break. On the way back from the beach we stopped at the Hamakua Macadamia Nut Company store in Kawaihae. The store offered plenty of free samples of macadamias in flavors including honey mustard, salted, garlic and even spam! There was a film about the harvesting of the nuts and windows that allowed you to watch the processing of the products. It's well worth a visit. Today we set off to learn some Hawaiian history. The birthplace of Kamehameha I, the king that united the Hawaiian islands in 1810, is near where we are staying. Nearby the birthplace are the ruins of Mookini Healau, an ancient temple site. To get to the sites, we followed the signs for the Upolu Airport on the north coast. Our guidebook says to take the left onto a dirt road in front of the airport, but it's too rough for our rental car. So we park and walk. Unfortunately, the wind on the north coast is horrific, and pretty soon we are covered with a light coating of sand that sticks to our sunblock. After a 20-minute trek -- which seemed a lot longer -- we get to the birthplace. And, wow, was it a disappointment. The birthplace is just four stone walls creating a square. No real explanation and little to look at. Tired and hot, we decide to head to the temple site about 10 minutes away up a hill. It's a bit more developed, and from the offerings inside it probably is active. But again it's just some walls of rocks without any explanation. The only reason we like it more than the birthplace is that there's a sprinkler going that we use to cool off. After hiking back to the car I decide to postpone our planned visit to a nearby ancient fishing village. 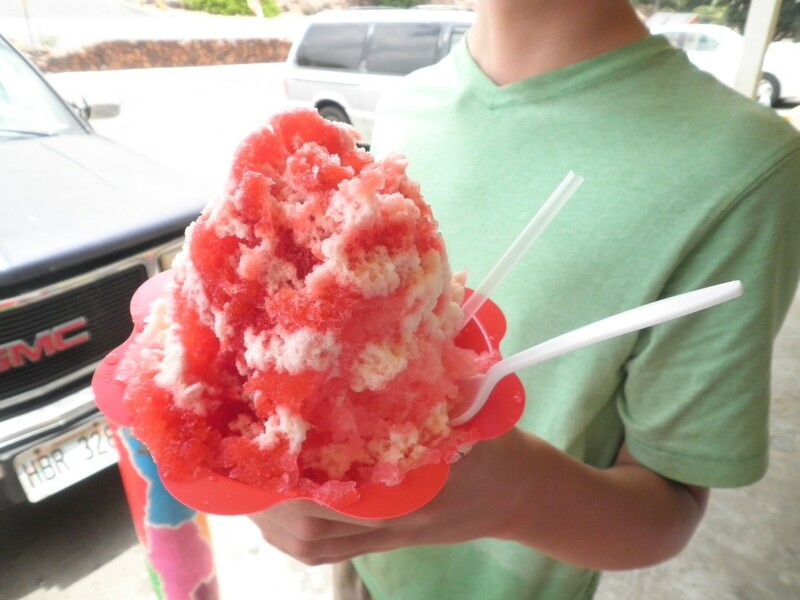 We drive to Kawaihae where I had spotted a stand selling a local delicacy: shave ice. Shave ice is similar to snow cones but the flavor sticks inside the ice a bit more because of the shaving. Best of all, you can get it with a scoop of ice cream in the middle. I try a combination of passion fruit and guava flavors, with mango ice cream in the middle. It is magnificent and very refreshing. Fortified, we head off to the Lapakahi State Historical Park. 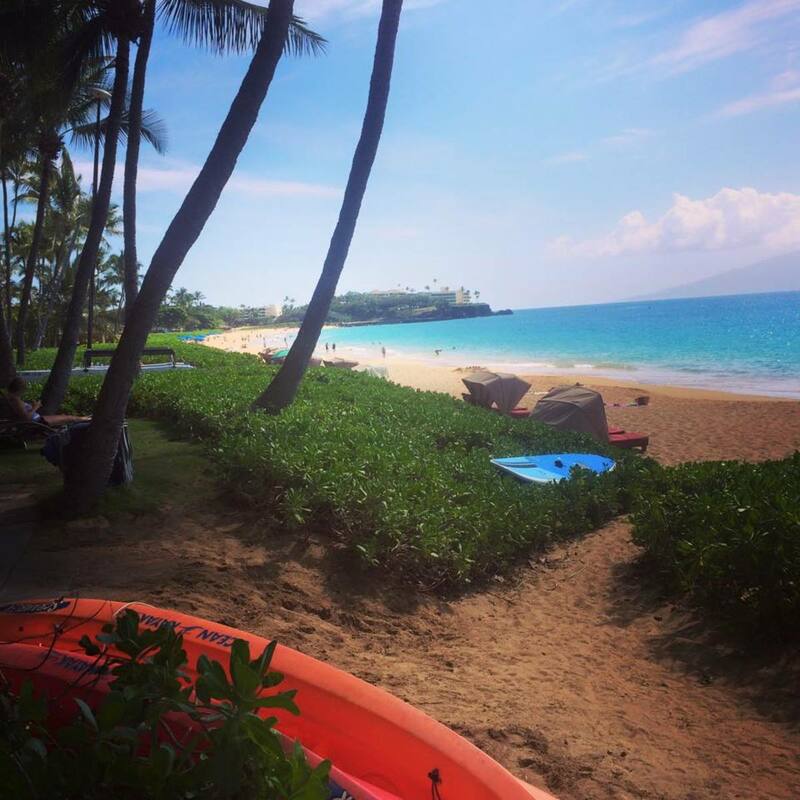 The park has a walk of about a mile through a partially restored fishing village that gives you a flavor of how Hawaiians lived about 600 year ago. It's an interesting place but very basic. Afterward we drive down to Kona for some shopping and on the way back along Route 19 we spot a number of cars parked near mile marker 19. Stopping, we discover that there's a large lava tube to explore. A lava tube is a long cave-like tunnel formed by lava flowing under other lava that has solidified. We climb down into the tunnel and travel 30-40 yards over jumbled rocks, then crawl up and out through an opening in the tube's roof. It was a neat unplanned stop that our 13-year-old really enjoyed. That night we ate at the Bamboo Restaurant in Hawi. The food was top notch, with the adults focusing on the fish of the day and the kids getting hamburgers and pasta. There was a local band that played traditional Hawaiian songs as well as Hawaiian-tinged pop songs including "Strawberry Wine" and "The Curly Shuffle." It's not an inexpensive place but the food was well worth it. Our third day on the Big Island was July 4. So we attended a Big Island Independence Day tradition -- the release of five Hawaiian green sea turtles into the ocean. The turtles, known as honu, were raised at the Mauna Lani Bay Hotel & Bungalows after being born at the Sea Life Park in Oahu. 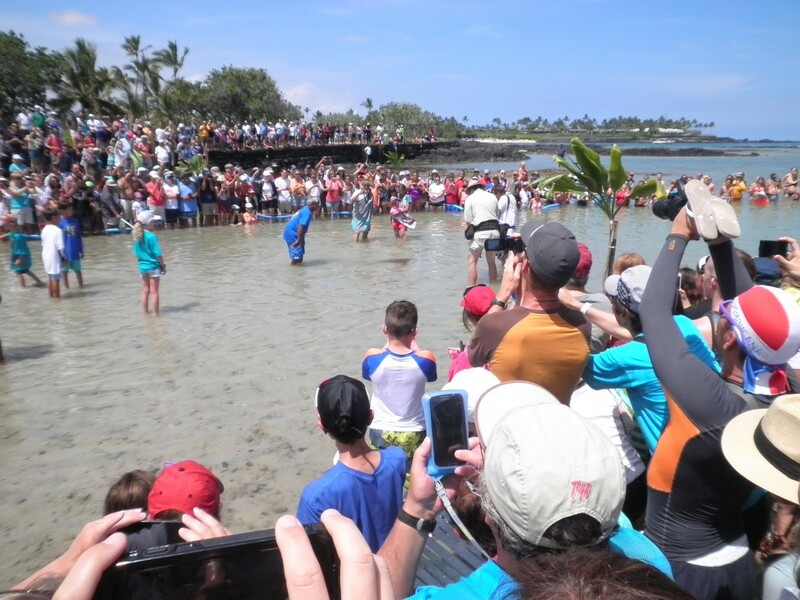 The turtles are kept until they are two to three years old, then brought to the resort's beach and released after a short ceremony involving local politicians, native Hawaiians and hula dancers. 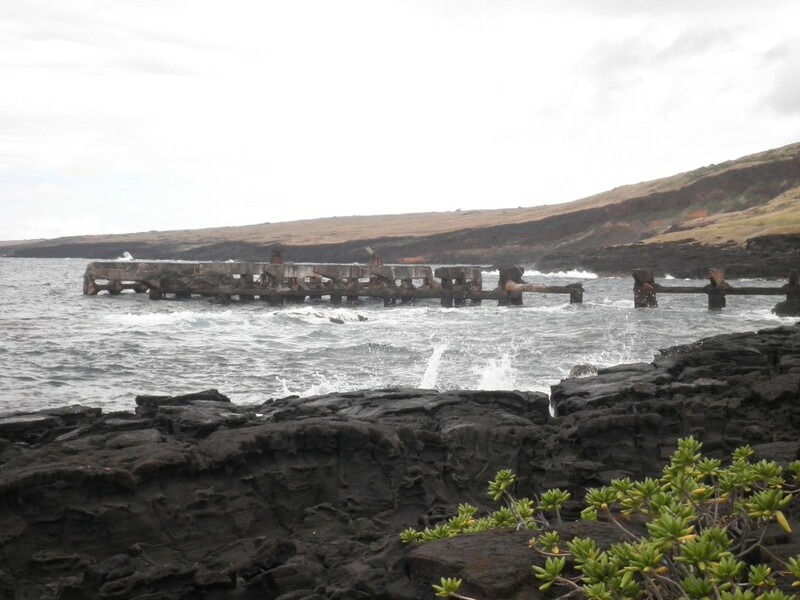 After lunch we headed south to Pu'uhonua O Honaunau National Historical Park south of Kailua-Kona. The park was once one of the island's most important places of refuge. In old Hawaii, a person who broke the chief's rules could escape punishment if he eluded capture and made it one of these refuges. In addition to the actual walled refuge, the park also includes royal grounds that were used by long-ago chiefs, their fishing ponds and an old fishing village. One thing that struck us is that the park has better and more explanations and displays than the state parks we visited the day before. Maybe there's just more federal money available. Guidebooks say this is the park to see if you are only going to see one on the Big Island, and we concur. After leaving the park we take advantage of one of the great things about being on the island. There are free beaches everywhere, including right down the street from the park's entrance. This one is a bit rocky, but we get out the snorkels and swim among the locals. Even with all the swimmers there were plenty of fish to look at. It's almost as if they are so used to people in the water they don't even bother swimming away. 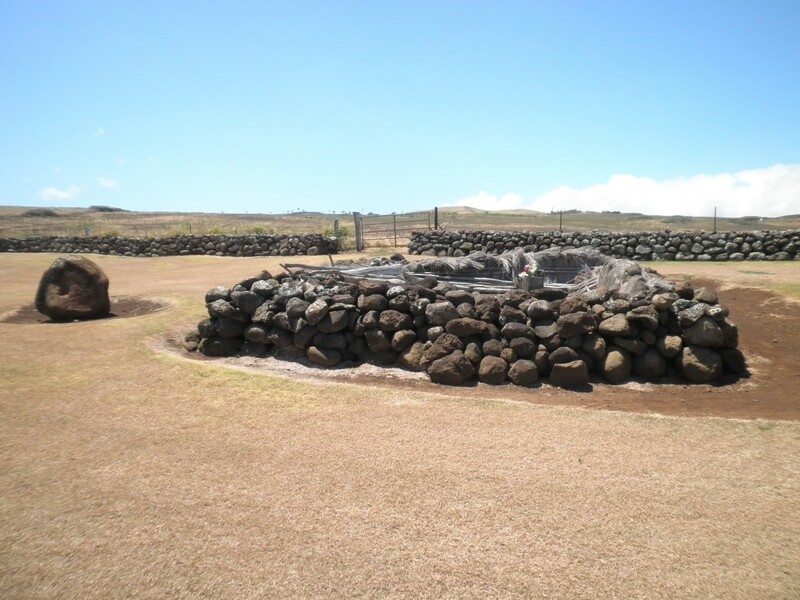 On the fourth day we continued our tour of Hawaii's historical sites with a visit to Pu'ukohola Heiau along the northwest coast of the island. 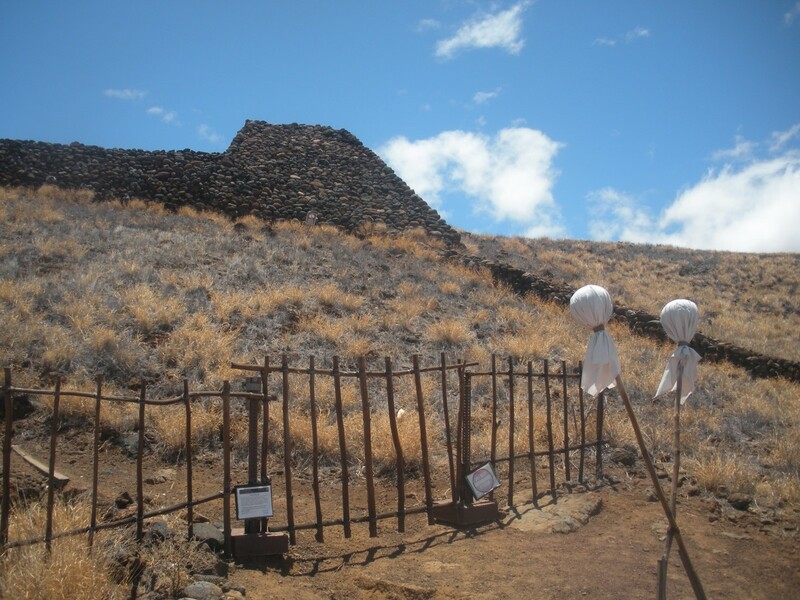 This national historical park explains the political rise of Kamehameha I and contains three heiau, or temples. In fact, we wanted to stop at the park because the largest of the temples is very prominent from the highway that we traveled every day. There is an easy circular walk that takes you to that temple, which you can't enter because there are some reports that it may be a sacred burial ground. In front of that temple is smaller one called Mailekini Heiau, which was later turned into a fort with cannon in the 1800s. 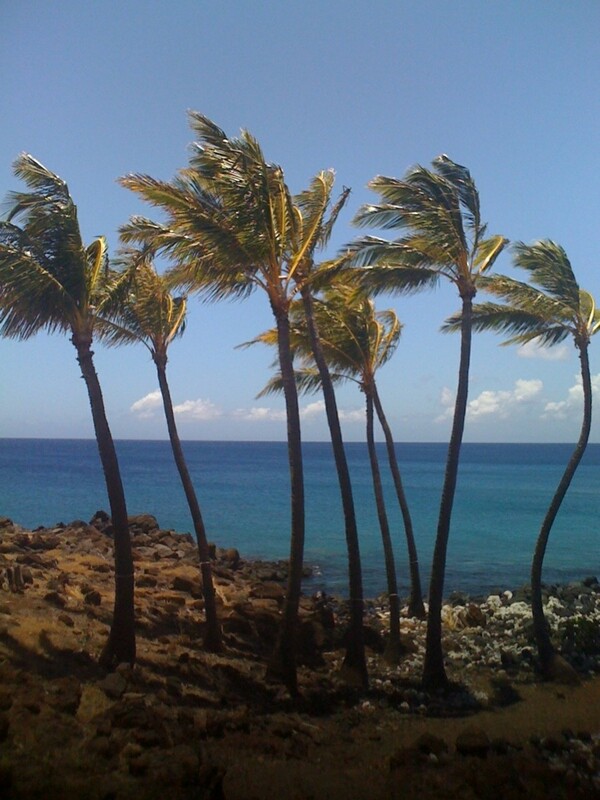 The trail meanders down by the water, where the third temple known as Hale o Kapuni Heiau is located. You can't see it though, as it is now submerged in the park's bay. That's kind of appropriate, since the temple dedicated to the local sharks. After the park we head down to Kailua-Kona's downtown to see the oldest Christian church in Hawaii and the Hulihe'e Palace, which had been the former vacation home of the Hawaiian royalty. Unfortunately, the palace is closed on Sunday so we lose out on that. We did visit the church, which dates from 1837. The building is an odd mix of New England architectural design combined with local lava rock and cast-off ballast materials. Not much to see, really, but afterward we visited Holy Donuts, a small shop with some of the most creative and delicious donuts we ever tasted. That made the downtown trip well worthwhile in our 13-year-old's opinion. After lunch we headed toward home, stopping at the beach at Wailea bay for a few hours in the water. The 13-year-old, perhaps fortified by donuts, followed the locals onto the rocks and made several jumps into the water. I knew he'd do it at some point. It was just too tempting. His mom thought it was dangerous, but he simply laughed and said there were only two large underwater rocks to miss so what's the big deal? Up until now we had focused on the western shoreline of the Big Island, so on the fifth day we decided to head east across the north side. 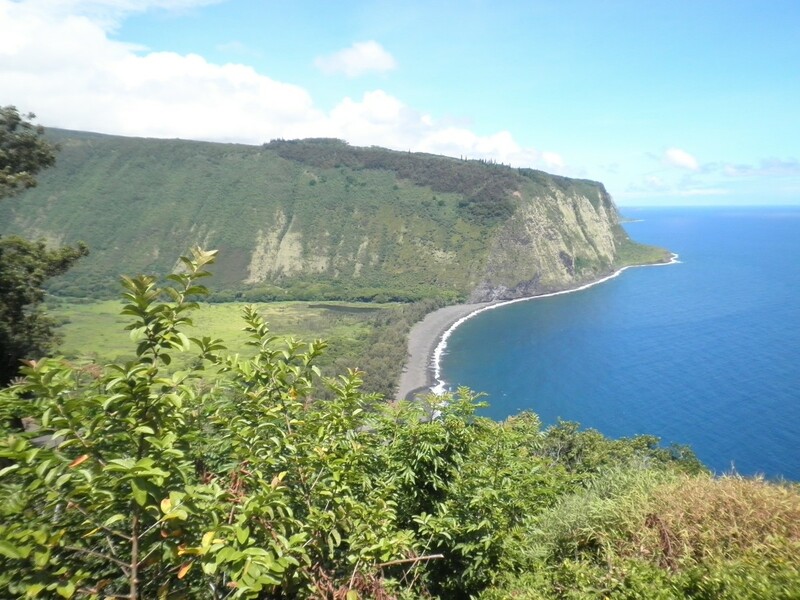 Our first stop was the lookout above the Waipi'o Valley, a gorgeous location where the green of the trees and foliage contrast sharply with the black sand beach. Only four-wheel-drive vehicles are allowed on the road into the valley, so all we could do was look from up high. We then searched out a restaurant called Tex Drive-in in Honokaa that we were told had the best malasadas on the island. These malasadas, a variation of the Portuguese-invented donuts, were as large as a Burger King Whopper and were offered with a variety of fillings. I had the Bavarian cream, and the main difference I found is that the dough was softer and bit moister than a regular donut. One would be enough for most people, but our 13-year-old was able to wolf down three! 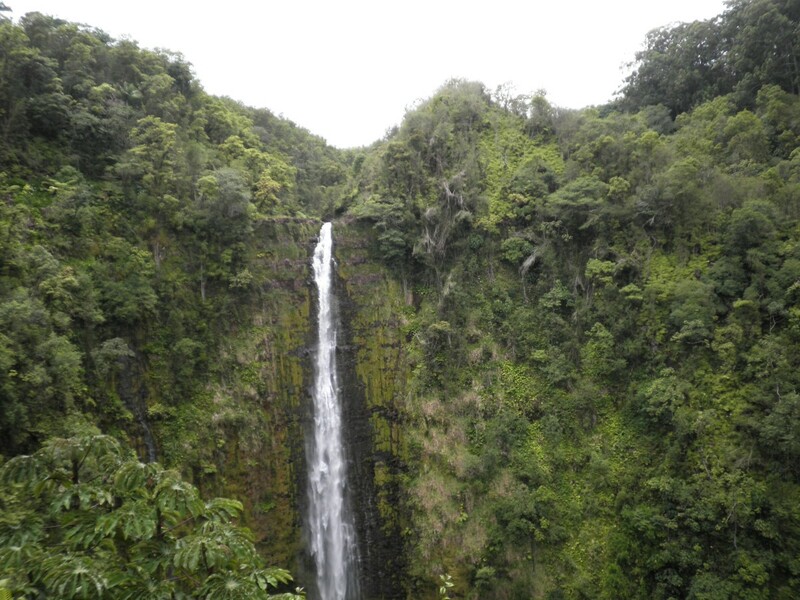 With our bellies bursting we continued our travels along the north side of the island, eventually curving south along the east coast to Akaka Falls State Park. 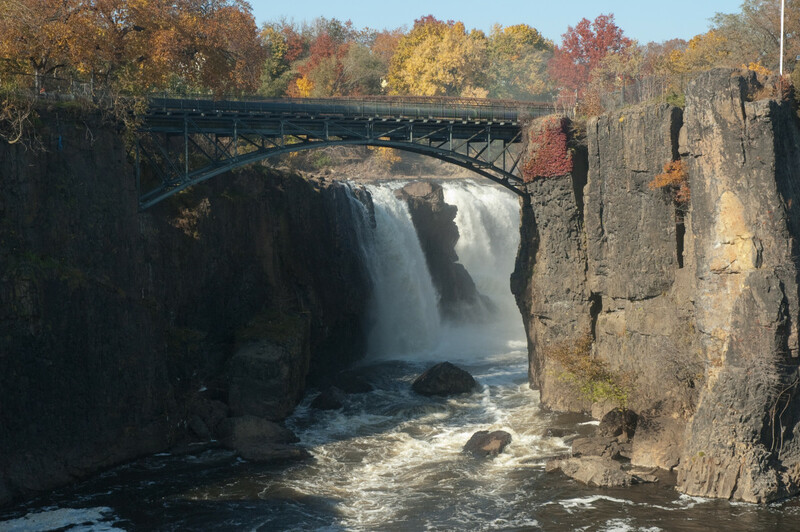 The beautiful falls is 422 feet high and you get a great view of it from the park's trail. Along the way you also see a smaller one, called Kahuna Falls. This is well worth a visit if you are on the east side of the island. On the road outside the park there was a local farmer selling fresh coconuts, so we stopped and had him cut one up for us. Delicious. He also gave us the water inside, but that wasn't nearly as good. We continued south into Hilo, which is the biggest city on the island with about 40,000 people. We stopped at the Lyman museum, which consists of a small natural history museum next to an historic missionary house. The museum does a great job in explaining how the Big Island was formed from five volcanoes, and there's a very sad exhibit of some of the animals and birds that once were native to Hawaii but are now extinct. Unfortunately, we were too late for a tour of the missionary house. But the woman behind the desk told us our tickets were good ''forever'' and that she just had a family come back after six years to get the tour. As we left I told her to plan on our return in, oh, about 10. We wandered along the downtown area, then out to Coconut Island with its small park. Later, we ate at Ken's House of Pancakes. Great food at reasonable prices. I had a local dish called loco moco, which consisted of white rice, a hamburger patty and a fried egg, covered in brown gravy. Very, very filling. Instead of driving back along the coast we decide to return by the Saddle Road which crosses between the Mauna Loa and Mauna Kea volcanoes and reaches an altitude of 6,632 feet. The paved road is in very good shape, but there's a lot of twists and turns and fog, making it a bit touchy. Since we were crossing so near we decided to drive up to the Mauna Kea Observatory visitor center even though it was closed because of protests from native Hawaiians. The protesters were angry over construction plans for the top of one of the mountains. Our poor rental car's transmission was grinding as we climbed up the mountain, and the air pressure caused our water bottles to implode. We finally made it to the center's parking lot at 9,200 feet above sea level. The stars were clear and very beautiful, but the night air was cold enough that we only stayed a short while before heading back down and home for the night. Along the highway between the airport and Kona is the Natural Energy Laboratory of Hawaii Authority campus, which looked intriguing from the road. So we decided to spend one morning there. And boy, were we disappointed. We paid $76 for the four of us, expecting to get a tour of the facilities. 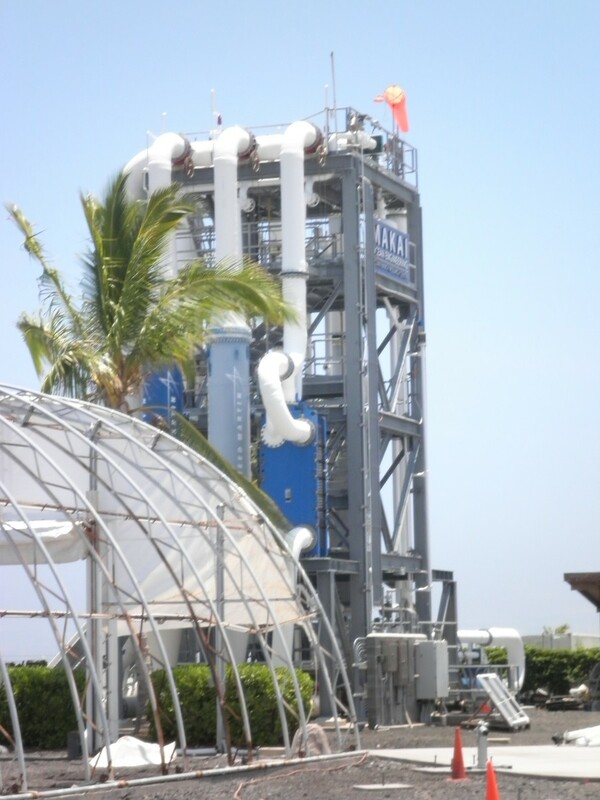 It turned out that the day we were there -- Tuesday -- they don't provide a full tour, and what we paid for was a two-hour power-point presentation by a volunteer and a short look at the ocean thermal energy tower. The presentation was on the level of middle school, and we learned some things, but it really, really wasn't worthwhile. Afterwards, we found out that that only the "grand" tour on Friday enables you to see what the occupants of the campus are doing. On the way out we did stop at the Kona Cold Lobsters, LTD. facility, where they are raising lobsters flown in from the Pacific northwest. The creatures grow faster in Hawaii because the warmth tricks them into thinking it's spring and summer all the time. The workers were kind enough to let us look around and hold some of the lobsters, which was pretty cool. We topped off the day with another long swim at Wailea Bay. On the seventh day we split up, with the 13-year-old and his mom doing the zipline course offered by Skyline Eco-Adventures near Akaka Falls. Our older child didn't want to go, so I volunteered to skip the activity as well. We dropped them off at the zipline headquarters and headed off. They did seven ziplines over more than two hours, with the last one going over a waterfall. Both said they absolutely loved it, and the 13-year-old calls it the best part of the vacation. While they were at the zipline course, the 16-year-old and I drove over to Honoli'i Beach Park north of downtown Hilo. The beach is known for some of the best surfing on the Big Island, and judging from the two dozen or so locals hitting the waves that reputation is warranted. And while it was interesting to watch the surfers, the waves looked rough enough that we decided it wasn't a good swimming spot. Instead, we went a bit north and found a nice hidden gem: the Kolekole Beach Park. Located under the main highway's bridge (! ), which soars 100 feet overhead, this park is in a gorge where the Kolekole stream meets the ocean. The ocean side is too rough for swimming, but it was magnificent to swim in the stream just before the fresh water collided with the incoming surf. We could feel the ocean's current push and pull us in the water, which wasn't very deep at all. Adding to the idyllic setting was a small waterfall that feeds into the stream. I held onto a rock and let the water from the waterfall try to push me out to sea, which sounds a lot more dangerous than it is. The locals have tied a rope to an overhanging tree and were swinging over the water and dropping in. Great fun. After picking up the other half of the family, we had lunch then headed into Hilo to the Lyman mission house. Behind the counter was the same woman we talked with the other day, when we were too late to take the tour. She remembered us with a smile. "I told you we'd be back,'' I said, "Though I thought it would be in about 10 years!" 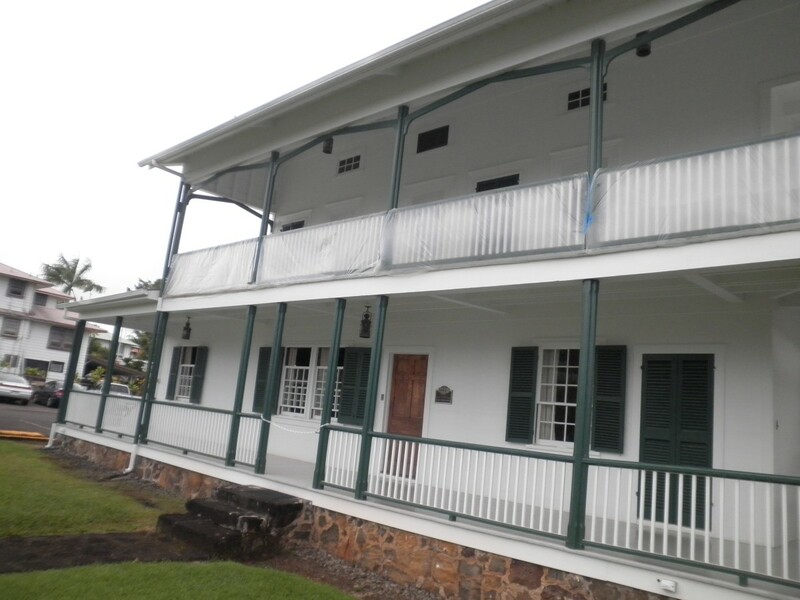 Built in the late 1830s, the New England-style home is the oldest wooden structure on the island and the tour does a good job showing what it was like to be missionaries living in Hawaii in the mid-19th century. The house has furniture, tools and household items used by the Laymans and other families from that time. We then went to the Pacific Tsunami museum a bit farther downtown. This small museum does a very good job explaining the impact of tsunamis on the Big Island, especially the 1946 one created by an earthquake in Alaska and one in 1960 that was the result of a Chilean quake. I found it especially intriguing to read about the 1960 tsunami because I lived in Chile for several years and knew a lot about that quake from the Chilean side. The best part of the museum was the survivors' individual stories, so make sure you check them out if you go. The museum is less interesting when it tries to go global and talk about other tsunamis. We were too late to catch it but there's also a video program to watch if you get there early enough. Afterward we stopped at Two Ladies Kitchen to get some fresh Mochi. The kids weren't impressed with the Japanese rice cakes, but my wife and I enjoyed them. The fresh strawberry ones were the best. On the eighth day we transitioned from our base in the northwest to a new rental place in the southern community of Ocean View. On the way we visited our friends in the village of Waikoloa, where our 13-year-old wanted -- and got -- a massage, which he loved. We then stopped at Kaloko-Honokōhau National Historical Park, north of Kona. Another old settlement, this park includes ancient fishponds, petroglyphs and sleeping sea turtles on the sand. We saw a good dozen of the endangered creatures, especially once we walked north a bit away from the main beach area. The petroglyphs are a bit inland and are easily marked on the trail. They were fairly crude but worth checking out. That night we ate at a restaurant called Mehe's down the road from where we were staying. It opened only a few days before, so the menu was extremely limited. The food was good, however, and the owner and a number of the employees stopped by to see how we liked things. The kitchen chef even came out to greet us. Afterward we drove up to an ice cream place called Gypsea Gelato in Kealakekua on our friends' advice, and boy were we glad we did! The place offered a wide variety of gelato flavors, and the servings were huge. Don't bother getting the largest size -- you won't be able to finish it. On the ninth day we decided to drive along the south coast of the island, starting with South Point (Ka Lae) -- considered to be the southernmost spot in the 50 United States. It's a pretty windswept place, with some locals fishing on the day we were there. There's also a wooden platform on the steep cliff for brave swimmers to jump off -- it's about 40 feet down into the ocean. (There's a rope ladder to climb back up). Our 13-year-old wanted to jump, of course. But when I told him that if anything went wrong he was on his own -- that I wasn't going to dive down to save him -- he decided to pass. Two teenage girls did make the leap while we were there, so people do indeed do it. But I had no desire. We drove east to see the Papakolea beach, one of the few green sand ones in the world. Unfortunately, it's quite a hike from the road -- more than two miles. Some locals in a four-wheel drive were offering a shuttle service for a few dollars, but we decided it wasn't worthwhile since we weren't planning on swimming. It was also way too hot for the walk. So we passed. Continuing east, we drove past the Mark Twain monkey pod tree in Waiohinu. Legend has it that the author planted a monkey pod tree here in 1866 while visiting the town. That tree was felled by a storm in 1957, but a shoot from it was planted on the spot. Either way, it's pretty unimpressive. 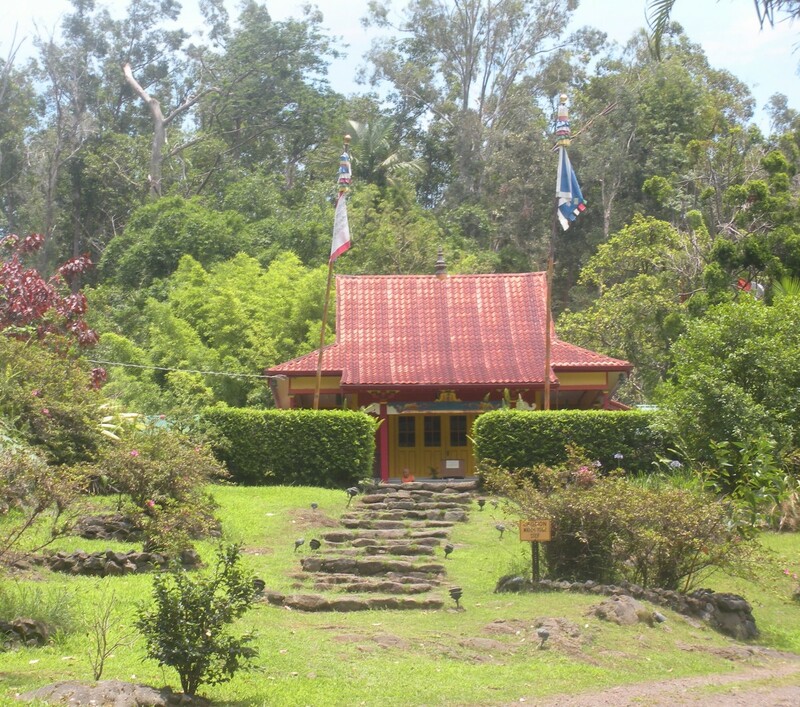 We then turned inland, passing through the former plantation town of Pahala into the Wood Valley, then past macadamia nut orchards and coffee farms to a Buddhist temple. The Wood Valley Temple, opened in 1973, is small but nestled in an idyllic setting. 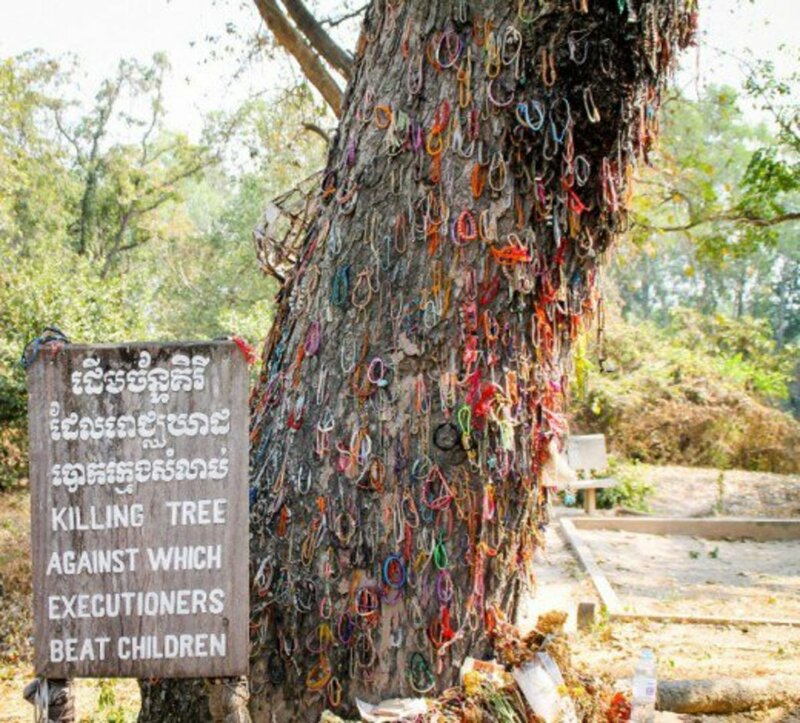 My wife had visited a number of temples in Asia so she found this side trip worthwhile, but the kids and I thought it was a long way to go to spend five minutes in meditation. We ended our drive east at the Hawai'i Volcanoes National Park. We weren't going to explore the park today, as it was getting late. But the fee was good for a full week, so we paid and went to the visitor center to get information for when we came back. While there I asked a park ranger if any lava was flowing that we could see. He told me that the only active lava flow was on private property east of the park. You can't walk to it, and it isn't visible by boat. The only way to see it is by helicopter. That was a bit disappointing. But we didn't have much time to think about it, since we had to race all the way back past Ocean View to Kona, where we were scheduled to go snorkeling with manta rays that night. These boat trips occur at night on Keauhou Bay. 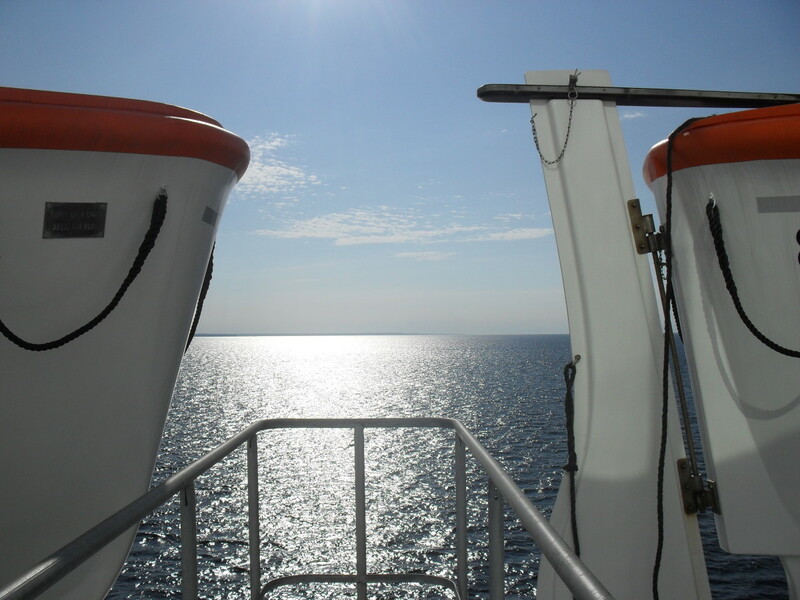 The tour company floats a long ladder-like structure in the ocean that has one or two spotlights aimed down into the water. Wearing a snorkel, wet suit and fins, you swim out and grab hold, then slip a noodle under your legs to keep them at the top of the water. In a short while the spotlights attract plankton, which is the manta rays' main food. The rays swoop up from the bottom of the ocean, turning upside down as they swim through the plankton with their mouths wide open. The rays, which look about six feet across, passed so close that I thought I could reach out and touch them. Adding to the fun were a school of blue needle-nose fish about 1-2 feet long that also feed on the plankton. The fish didn't seem to have any fear of humans and they came right up to my face on several occasions. It was really special, and I would have stayed out there all night but the tour guides eventually insisted I had to return to the boat. The kids teased me because I was the last one out of the water. 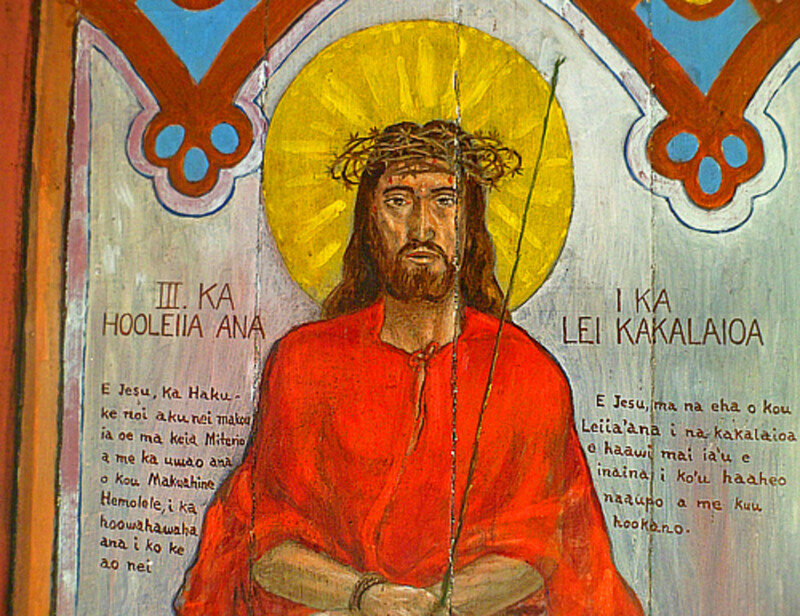 On the tenth day we decide to visit the Puna district, which is the lesser-developed southeastern part of the island. On the way we stop at the Fuku-Bonsai Cultural Center, which is kind of hidden off the main road through Kurtistown. The sign leading to the center was almost impossible to spot even though we were looking for it. There were two dozen or so bonsai trees to look at, with many for sale for hundreds of dollars each. My wife really enjoyed looking at them, while my 13-year-old dozed in the car and the 16-year-old and I dutifully walked around. The 16-year-old was a bit bummed because friends back home in New Jersey were gathering at the local 7-11 store for free Slurpees (It was July 11 - 7/11, get it?). I remembered that we had passed one of the few 7-11s on the island in Kurtistown, so that was our next stop. It wasn't as good as hanging out with friends, but my teen did enjoy the free Slurpee! We then traveled to the Lava Tree State Monument. 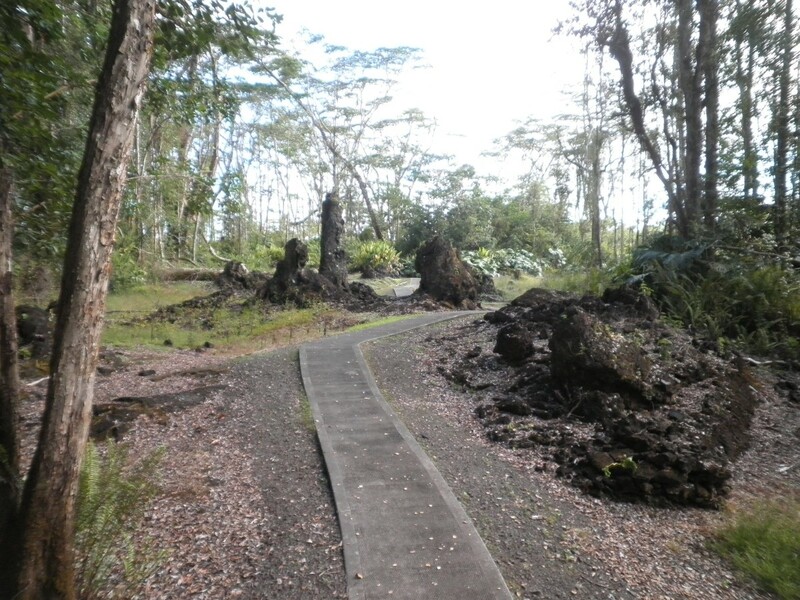 This creepy park contains the remains of a lava flow from 1790 that swept through the area and coated the trunks of Ohia trees. The result was dozens of tall lava molds that have stood the test of time. We had been warned that the roads of Puna district were poorly marked, so when we went looking for the Kumukahi Lighthouse somehow we ended up on a really desolate road driving along under a canopy of trees. It may have been the Red Road but we're not sure. The part we were on was unpaved with lots of ruts in it, and we finally ended up turning around. When we found the lighthouse it turned out to be a pretty boring structure. I'd advise skipping it. We also traveled west along the southern coast, through Mackenzie State Park to where the road was ended by a long-ago lava flow. That night we ate at Kaleo's Bar and Grill in Pahoa, which turned out to be top notch. I'm not a big meat eater anymore, but I had heard that the beef on the Big Island was very good. So I ordered some steak, and it was very tasty and tender. Best I've had in a long time. The town itself was very sad-looking though. 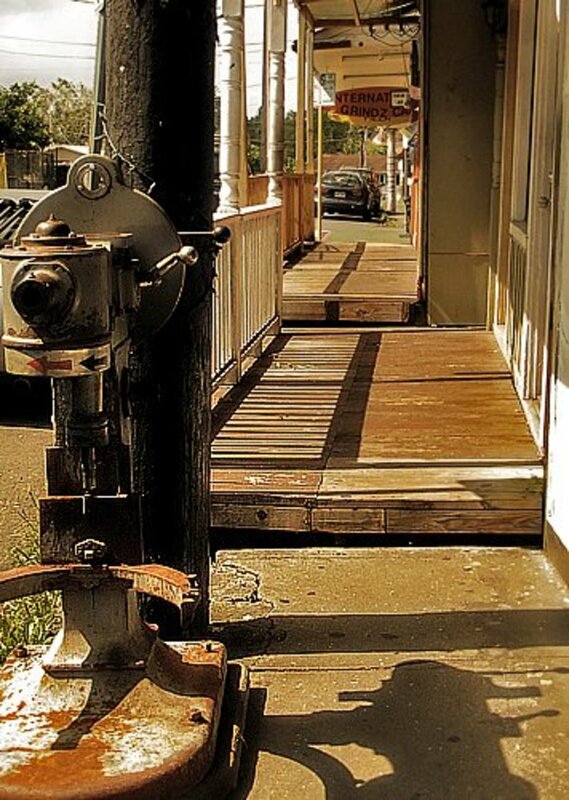 A good number of the storefronts along the main street's boardwalk seemed closed, and our friends said that was because Pahoa was in the path of a 2014 lava flow. A lot of people fled when it seemed the town would be overrun, and even though the flow stopped just short of the buildings many people didn't come back. We set aside our entire eleventh day on vacation to the Hawaii Volcanoes National park -- and that still wasn't enough time to do everything we wanted to do. 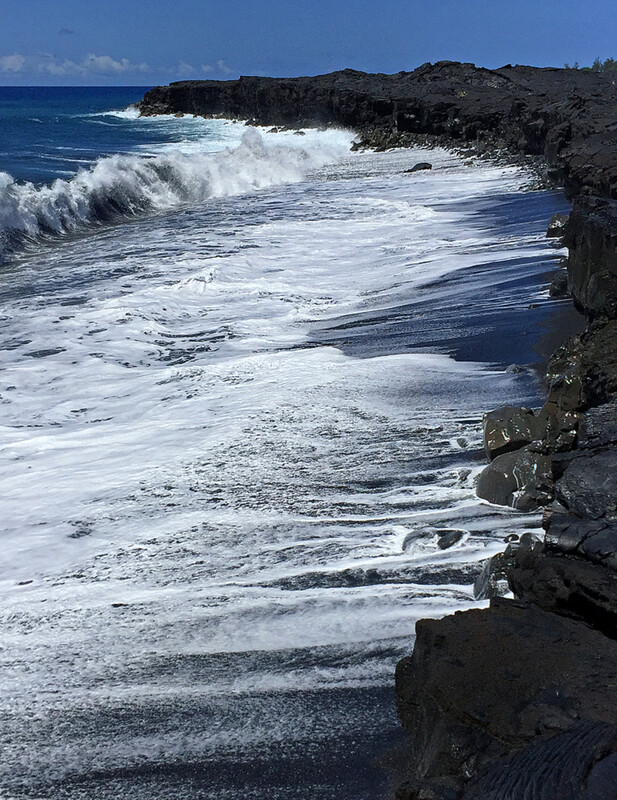 The park extends from the southeastern shore of the Big Island up to the summit calderas of Kilauea, considered one of the most active volcanoes in the world, and Mauna Loa. There are plenty of hiking trails that we simply didn't have time for. Instead we focused on the main attractions and areas. We started with a walk from the visitor center to a series of steam vents and sulphur banks -- we could smell the sulphur as we got near and could feel the heat of the vents. Seeing the steam leak out of the ground brought home to us that we were entering land where Mother Nature truly was alive. After crossing the road you can see the Kilauea caldera in the distance -- the far distance since the area is dangerous enough to be off limits. We then drove down the Chain of Craters Road, planning on seeing the Thurston Lava Tube. But somehow we parked in the wrong lot and ended up on the Kīlauea Iki Trail. 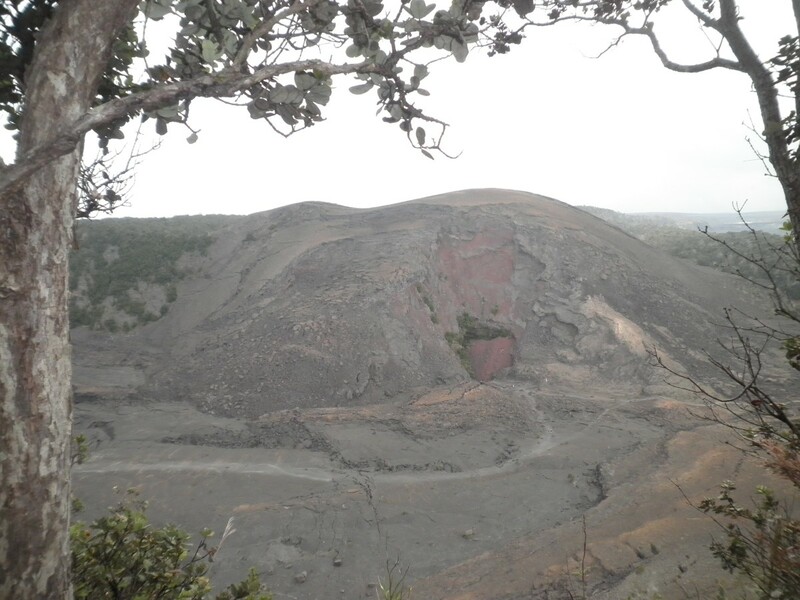 The trail takes you through a rainforest along the rim of a small volcano, then down about 400 feet to the crater floor. The floor is actually a lava lake about 400 feet deep that was created by an explosive blast in 1959. To me it was just stunning to walk across a valley floor that was only a few years older than I am. Of course, once we got out in the middle of the valley where there was no shelter it started to rain! We were soaked by the time we got to the car. With the kids napping, we drove down to the end of the road and checked out the Holei sea arch. It's about 90 feet high and about 550 years old -- and it is widely expected to collapse into the sea at some point. On the way back up the road we stopped to check out the Pu'u Loa Petroglyphs. On the map it looked like the petroglyphs are right near the road, but actually it's a bit of a hike to get to them (about 1.5 miles round trip). If the rain hadn't cooled things off we might have skipped the trek. As it was, the petroglyphs were OK but not really much different than we had seen at the Kaloko-Honokohau National Historical Park a few days earlier. If we had known that we might not have made the walk. We left the park for dinner, and then returned as the sun went down. We had been told that the red glow from the Kilauea caldera was magnificent after dark, and the best place to view it was from outside the Jaggar museum. Apparently, we weren't the only ones who were told that because there was a crowd outside the museum, and security had to direct traffic. Sadly, though, it had started raining again, and with the rain and clouds the lava glow was incredibly unimpressive. We popped into the museum, but that too was a disappointment. It is very small and only has a few objects of interest. On the twelfth day we took to the air. When we first stopped at the volcanoes' park visitor's center I asked a park ranger where we could see lava flowing. He told me that the only live flows were on private property east of the park, and the only way to see them was from above. Our flight was for early afternoon, so we had all morning to meander over to Hilo. First we stopped at Akatsuka Orchid Gardens just east of the volcanoes' park and marveled at the wide variety of plants available. Tours of the facility were too expensive for our taste so we passed on that. Next we hit the Pana'ewa Rainforest Zoo on the edge of Hilo. The zoo is small, but had a number of animals that we don't usually see on the East Coast of the U.S. Kinkajous, mini zebu, and nene were pretty neat, but the kids really enjoyed the Hyacinth macaws. 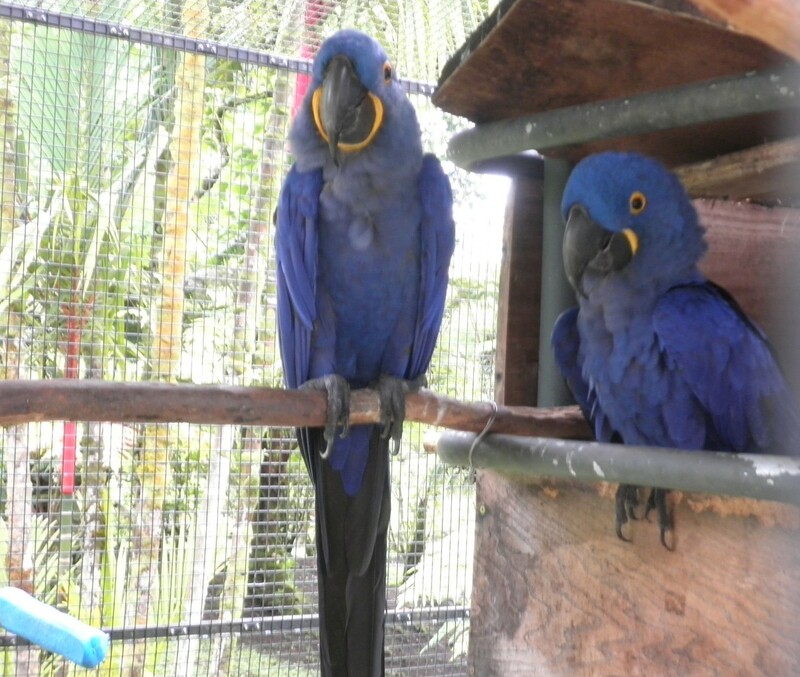 Hyacinths are the largest macaws and the largest flying parrot species, being more than three feet from head to tail. And the ones at the zoo were extremely vocal, calling to our children over and over again. The free zoo took only about an hour to walk through. We then headed to the airport, squeezed into the copter with a young couple and the pilot, and away we went. The copter took us over an expanse of lava flow that changed from almost black to gray as the ground below rose toward the volcano top. Tom, our pilot, explained that the lava goes from red to gray to black as it cools, and then flew us over an area where it was flowing like a gray stream. He then took us over a caldera, where we could look down into the red bubbling, molten lava. It's hard to judge size when you are hovering in a helicopter more than 1,500 feet above the Earth, so I asked Tom how wide the caldera was and he estimated 300 to 400 feet. We then flew north. We were west of Hilo following some of the rivers that flow down from the volcano top, and we marveled at the many cascading waterfalls that exist on the island -- these falls are the result of all the rain that comes down from clouds caught by the volcanoes, and there are so many falls most don't even have names. After flying back over Hilo -- which was pretty cool in itself -- we landed back at the airport. The flight was less than an hour but well worth the money. We popped over to Mauna Loa Macadamia Nut plantation south of the airport, to check out the free samples and get some things to bring home. There's also a free self-guided tour where you can see how the nuts are processed. (just FYI the company isn't as generous with handing out samples as the one we stopped by in the northwest of the island). We also hit Hilo's Wal-Mart to get souvenirs since it offered some of the best prices. 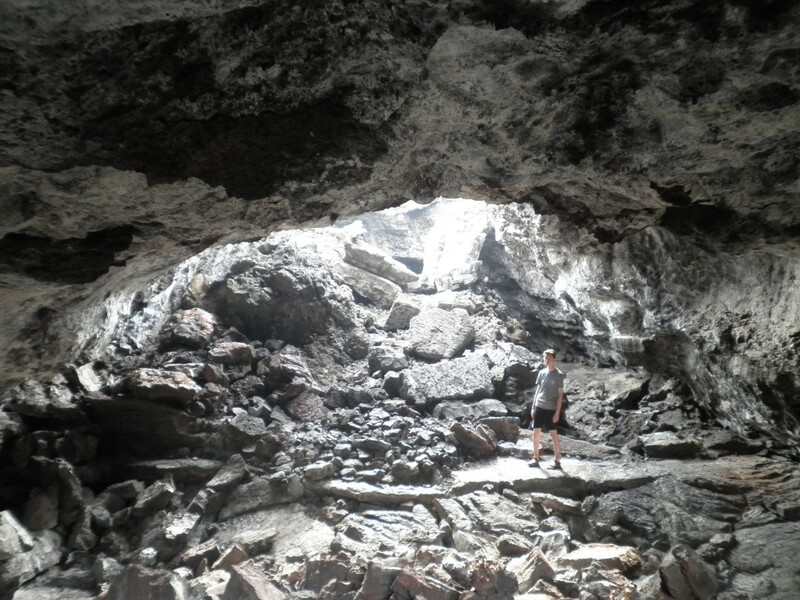 We then decided to head back to the volcanoes' park to see the Thurston lava tube that we missed a few days earlier, and it was kind of neat walking the 500-year-old cave. The tunnel is spacious and well lit and an easy walk down some stairs. Just for the heck of it, we also stopped by a section of road that had been partially covered in a 1972 lava flow. After dinner it was dark enough for us to try the Kilauea caldera glow again. And this time, with the weather clear, the bright redness was kind of cool. One other thing we noticed -- standing in the park the stars were just as clear as when we drove up the top of the volcano a few days earlier. So if you don't want to go all the way up the volcanoes -- or if physically the altitude would bother you -- just go to the park in the middle of the night to see the brightness of the stars. By the thirteenth day we were ready for a sleep-in and some lazy beach time. At late morning we headed south and stopped once again at the Punalu'u Bake Shop, then hit nearby Whittington Beach Park. We had heard this wasn't a park on many tourists' itineraries, and sure enough there were only two local families there that day. I suspect that's because it isn't a sandy beach. It’s a rocky one, but the nice part about that is there's a ridge of rocks about 10-15 yards off the shore that breaks the surf and creates a reasonably quiet pool of water to swim and snorkel in. We were amazed at how many fish there were in this pool, and would recommend the beach for that reason alone. One warning though: there's a gap in the ridge where the water rushes in and flows back out, and you really feel a strong pull there. So if you aren't a strong swimmer stay away from that section. At one end of the beach are the remains of an abandoned pier that once served the local sugar farmers. The 1946 tsunami left the pier in ruins. 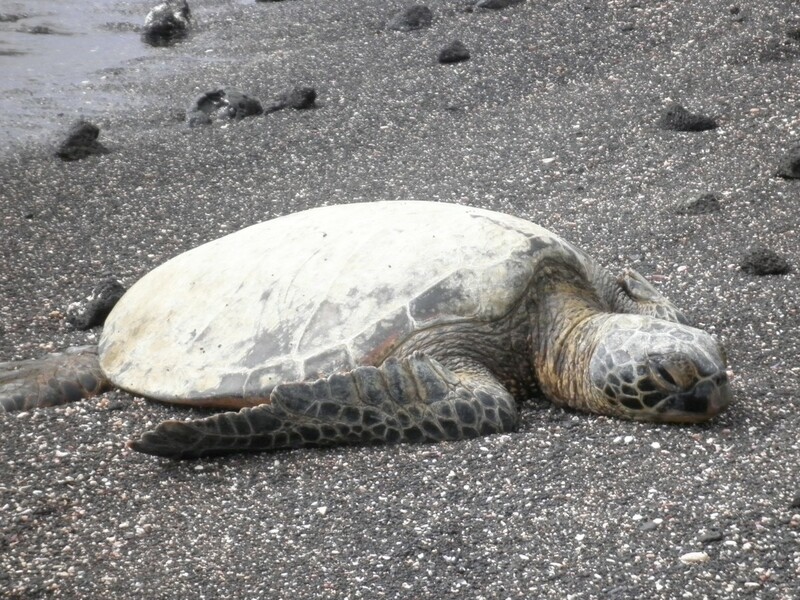 We then decided to hit the Punalu'u black sand beach again to check out the sea turtles. There were a few sunning on the beach, but we ended up not staying long because there were a lot of tourists and the snorkeling wasn't good that day. It may that there were too many swimmers and that kept the fish away. After going back to our quarters and freshening up, we headed north to a restaurant called Annie's Island Fresh Burgers in Kealakekua. We had heard that Annie's served some of the best burgers in the U.S., and we wanted to check that out. Our youngest isn't much of a meat-eater but he had the classic and decided it was the best burger he's had in years. I had the burger with bacon and bleu cheese and that was fantastic as well. On the last day of our Hawaiian adventure we decided to visit our favorite beach. Waialea was as wonderful on our last day as it was on our first, and we recommend it to anyone who ever visits the Big Island. Before we headed to the airport we visited our friends in Waikoloa village to shower and clean up. Shanon and Ronja are, among other things, aerial artists -- the type that perform in the air using two long pieces of silk to twirl around. Our younger boy and I popped over to watch one of the classes they teach, and during the break we were persuaded to give it a try. And so we ended up hanging from a ceiling, swinging around aimlessly, out of control and without a care. It was a great way to end our Hawaiian adventure. Please share your thoughts of the Big Island! Thanks for sharing your diary. Sounds like a great trip with good photos for illustration.